Boynton Beach Historical Society » History » Did a famous war start in Boynton? Did a famous war start in Boynton? Most people have heard of the Spanish-American War – Teddy Roosevelt’s Rough Riders charging up San Juan Hill, the sinking of the Maine in Havana’s harbor, or Admiral George Dewey’s victory in Manila. 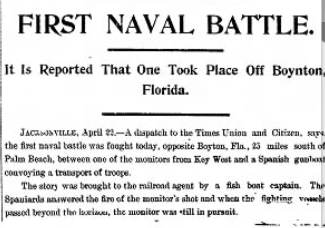 But if the earliest accounts of the Spanish-American war are correct, the first naval battle was fought offshore of a tiny town called Boynton. Spanish man-of-war that was guarding a coal ship, probably on the way to Havana. He said that all the ships were traveling “with a bone in their teeth,” meaning they were traveling at top speed. He watched the battle for an hour before rushing to the railroad agent in Boynton, who wrote the dispatch to the Florida Times-Union in Jacksonville. Spain declared war on April 23, with the United States following suit on April 25, 1898. Beyond the newspaper accounts of April 1898, there is no other mention I can find of the skirmish that occurred off of Boynton. But it put the little hamlet’s name across the nation for its first 15 minutes of fame. 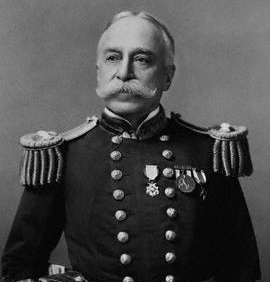 The Spanish-American War lasted but three months, and the lore of the first battle was lost to time. 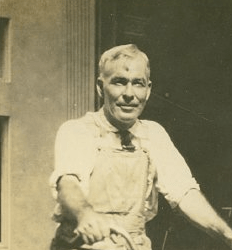 Newspaper clippings from public domain sources; photo of George Lyman from the Historical Society of Palm Beach County.